Watchman Nee was a Chinese Christian author and church leader during the early 20th Century. He was one of the founding fathers of The Church Assembly Hall later known as the “local churches”. Watchman Nee experienced a religious enlightenment, and joined the Church of Heavenly Peace, Fuzhou in 1920 at age 17 and began writing in the same year. In 1921 he was influenced by the British missionary M. E. Barber, and became introduced to intense and impressionable Christian writings. During his 30 years of ministry, beginning in 1922, Nee traveled throughout Asia establishing churches among the rural communities and holding Christian conferences and trainings. The ministry of Watchman Nee has been one of the most significant and spiritual to emerge during this century. He was instrumental in taking the teachings of Christianity to that side of the world. 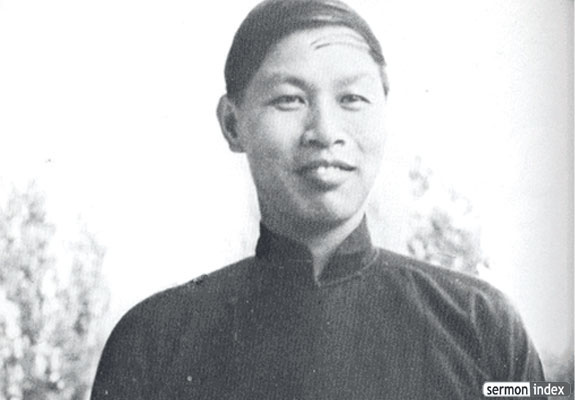 Nee Shu-Tsu (Watchman Nee) was born in Foochow, China. Nee’s father was Ni Weng-Sioe (W. S. Ni) and his mother was Lin Gwo Ping (Peace Lin). Both parents were Methodists, and Nee was baptized as a child by the American Methodist Episcopal Mission. In his youth Nee displayed the level of intelligence that resulted in an excellent academic record; his essays were often displayed on the bulletin board at school. On the evening of 29th April, 1920, I was alone in my room, struggling to decide whether or not to believe in the Lord. At first I was reluctant but as I tried to pray I saw the magnitude of my sins and the reality and efficacy of Jesus as the Savior. As I visualized the Lord’s hands stretched out on the cross, they seemed to be welcoming me and the Lord was saying, “I am waiting here to receive you.” Realizing the effectiveness of Christ’s blood in cleansing my sins and being overwhelmed by such love, I accepted Him there. His conviction in the gospel persuaded Nee’s classmates to also embrace the Christian faith. During Nee’s college years an independent British missionary named Margaret Barber was his teacher and mentor. Watchman Nee became intimate with the Bible through diligent studies and methods which including reading the spiritual books of various authors. Nee sought to establish a Christian church in every city or town within China, under the premise that, believers should not be divided by apostles and their ministries nor should they be divided by spiritual gifts, racial or social statuses, or different doctrines. Between 1923 and 1949 700 local churches were erected with a combined following of over 70,000. During the Chinese Communist takeover, these “assemblies” formed the core behind the house municipalities. Through the efforts of Nee and his colleagues, local assemblies were founded all over China and among other Chinese-speaking communities in the Far East. In 1952, Watchman Nee was imprisoned by the Chinese government for his faith and influential involvement in the local churches. He had decided to remain in China despite the threat of Communism. Nee was sentence to fifteen years of imprisonment in 1956. He remained in prison until his death sixteen years later.